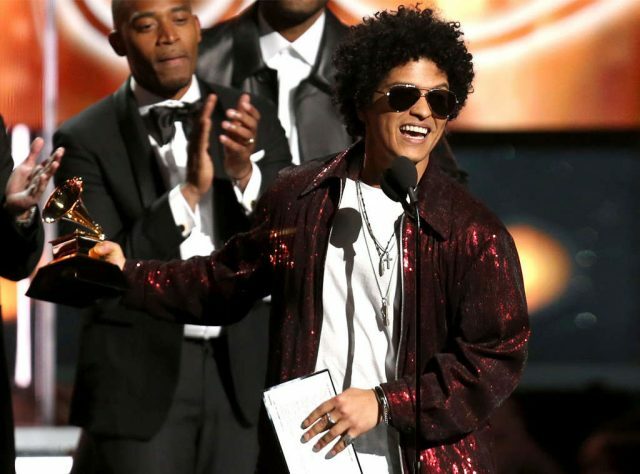 Bruno Mars wins Grammys 2018 for party anthem "24K Magic"
(AFP): Bruno Mars won the Grammy on Sunday for Record of the Year for his party anthem “24K Magic,” the first time the funk revivalist has won the US industry’s award for top song on his own. “24K Magic” is the title track of the Hawaiian-born singer’s third album, which revives his mix of fun-loving retro funk but adds touches of 1980s-inspired synthesizers. Taking on the braggadocious style of a rapper in the song, Mars addresses “playas,” “hustlas” and “gangstas” as he describes arriving at a party where the sight of hot women is “waking up the rocket” in his pants. Mars, explaining the song in an interview, said he saw his mission as bringing good times in an often difficult world. Mars previously won Record of the Year two years ago as the featured artist on Mark Ronson’s equally giddy “Uptown Funk.” He was nominated three previous times in the category without winning. He beat out the global sensation “Despacito” as well as songs by rappers Jay-Z, Kendrick Lamar and Childish Gambino.